A steampunk fantasy set in a world that draws some uncomfortable inspiration from our own, Foreign Devils is the sequel to John Hornor Jacobs’ The Incorruptibles and follows the adventures of Fisk and Shoe – two would be mercenaries making their way through a world of demons, feral elves and worse. The story is told in a suitably gritty first person narration from the recollections of Shoe – the dwarf. The second book picks up from where the first book left off, with Fisk and his new wife Livia. Both are sent on separate missions and so the book’s narrative divides, although we continue with Shoe as primary narrator and Livia’s recollections are sent to Fisk via the Quotidian, a blood enabled personal communication system, and he provides an edited version to Shoe, preserving his partner’s role as the journal keeper. 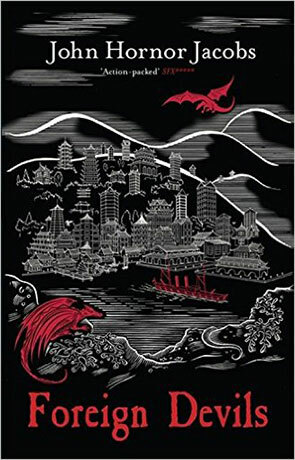 Hornor Jacobs expands his canvas by sending half his cast to Tchinee – the analogue of China in his fantasy world. Livia’s petition on behalf of Rume is to secure their support in the oncoming war against their Medieran enemies, whilst Fisk and Shoe continue to hunt down Beleth, the rogue demon engineer. Hornor Jacobs’ world of Occidentalia is a fusion of western, steampunk and old religion. The religious language is much more closely related to our own world than many fantasy authors choose to tread, with Hornor Jacobs’ demons very much unwashed from their satanic origin in the way the characters discuss them and other references are much closer to home than we might be accustomed. The starkness of The Incorruptibles is muted somewhat in this sequel and some of the unsettling culture parallels of prejudice and class from the first novel are less pronounced. In some ways this is a shame as we are less inclined to reassess our own legacy. The direct correlation is retained and used when exploring the nature of slavery from a personal standpoint and we do see characters demonstrating the kind of filtering needed to endure the ways in which their supposed superiors treat them as objects. In the early chapters, some of the principle characters – particularly Livia – are starting to connect their own unconscious mistreatment of those considered beneath them with the blatant denigration performed by others. Foreign Devils concerns itself more with the hunt and the introduction of the new Tchinee culture. We do get an interesting interlude related to the downtrodden Dwarves who are gradually coming to resent their oppression and this bodes well for a further instalment that might explore praxis. The book is much longer than its predecessor and the diverging plot lines means it is less of a page turner. However, the world devised by Honor Jacobs is unique and interesting with its developing mythology, technology, demonology and dark magic. There is substantial grit to the writing throughout and Hornor Jacobs does not compromise in his description of events. There are surprising twists and turns, with character’s murdered, kidnapped and tortured as the writer requires. The conclusion of both quests providing revelations in equal measure. If you’re seeking a gritty steampunk series, which offers interesting characters in an analogous real world setting, you’ll find plenty to like in Hornor Jacobs’ series. Written on 12th February 2016 by Allen Stroud.